Homing In, CQ Magazine, February 2019 -- "Tales of the 2018 CQ Worldwide Foxhunting Weekend"
N8THN: "Over the river and through the woods, a sly little fox he was. So sly that this little fox sought the help of his twin." N8THN: "Key your radio, identify your transmission and press the 1 key. If you are close enough for the fox to hear you, it will begin transmitting a sequence of tones for 30 seconds followed by a Morse ID." NM9J: "Notes were compared, routes were recalled and antennas were evaluated. Here's to next time when N2EAB will be invited to play the fox." KR7W: "I arrived early for a two-hour walk in the woods to hide four bunnies at locations that were were progressively more difficult to find. The farthest was almost a half-mile away, sending its Bugs Bunny cartoon message, 'What's up, Doc? Heh, heh, heh, heh.'" N6SZO: "Each fox transmitter had a piece of colored tape on it so that when the Scouts returned, they could tell us what color of tape was on the fox they found so we could verify that they found the correct one." CQ Magazine, November 2018 -- "Most Medals Ever for ARDF Team USA in Korea"
"This coastal city of 90,000 persons is known for its fishery products and nearby hot springs. It lies north of the 38th parallel, but it is part of South Korea." "I issued invitations to thirty persons to compete for USA ... Because of health issues, economic considerations and activity conflicts, only eleven were able to accept." "The accommodations were excellent, the nearby mountains were beautiful, and the weather was mostly dry and pleasant. Over 300 competitors gathered from 29 nations. 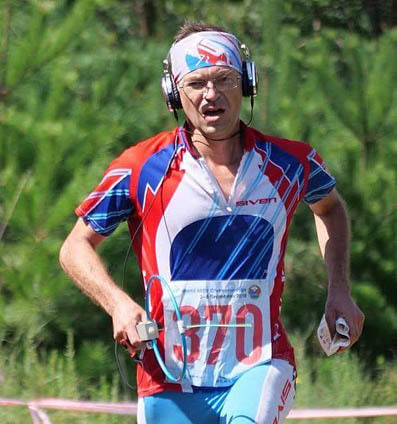 The largest category was M50 (men ages 50 through 59), with 44 entrants." WB6CMD: "There were thick bushes, trees and vines everywhere, so it was very slow and you had to choose your route carefully. Going north and south was very difficult unless you went on a very small trail and had to knock through some jungle." "During the award ceremony, the Star Spangled Banner was played on the loudspeakers and was proudly sung by all of the Team USA members as Vadim Afonkin KB1RLI accepted a gold medal." Homing In, CQ Magazine, September 2018 -- "Champion Foxhunters Travel from Truckee to Sokcho"
"Truckee sits along Interstate 80, one hundred miles northeast of Sacramento and thirty-three miles southwest of Reno, Nevada. It is best known as a wintertime haven for skiers, close to the famous Donner Summit." "In 2012, the Bay Area Orienteering Club (BAOC) commissioned a map covering 3,400 acres around Little Truckee Summit. 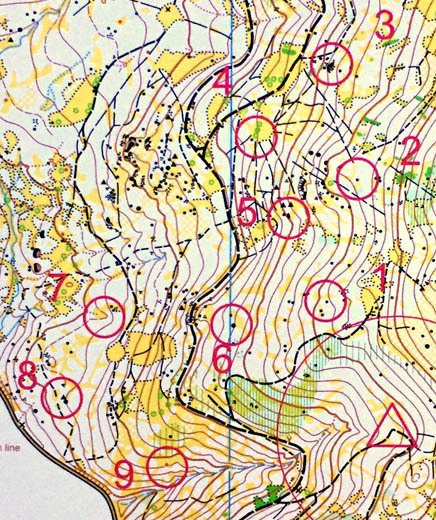 The result is one of the finest orienteering maps in the USA." "Such a direct route would have encountered steep hills. Taking the trails and flatlands exclusively increased the total distance to about five miles." 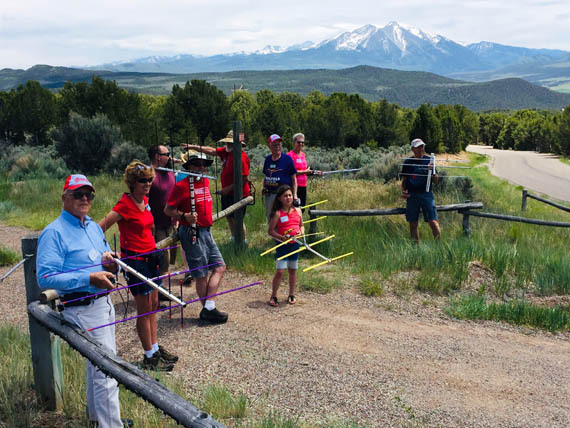 "To obtain the Radio Merit Badge with the ARDF option, Scouts must build a simple direction-finding antenna for either of the two bands that are used for competitive ARDF (2m and 80m) and then participate in a simple foxhunt." "Many youth instinctively turn the antenna until the signal comes up and then stop abruptly, often before the antenna points to the transmitter. Help them learn to swing the antenna back and forth across the maximum signal indication to pinpoint the actual peak." Foxoring is the only ARDF event in which the approximate transmitter locations are pre-printed on the map. Competitors use their orienteering skills to navigate to the area of the circles, where the QRP transmitters can then be heard and tracked. This segment of the 2018 USA Championships foxoring map shows nine of the ten transmitter circles and the starting point, which is denoted by a triangle. Read all about the championships in Homing In for September 2018. Homing In appeared monthly in 73 Magazine from November 1988 until the magazine ceased publication with the September 2003 issue. My column then appeared in CQ VHF magazine, a quarterly publication, from 2004 through Fall 2013 and CQ-Plus Digital Magazine during 2014. Now it appears four times per year in CQ Magazine, which is available in print by subscription and in Amateur Radio Stores. You can also subscribe to CQ in digital form, viewable on PC, Mac, iPad, iPhone and Android. I welcome your input for future articles, so please continue to send me your news of mobile and on-foot transmitter hunt activities. The Fine Print: This is the official Web site for Homing In and other KØOV articles about RDF, but not for any magazine. Homing In articles are produced independently in southern California. Text and artwork of all articles Copyright © Joseph D. Moell. All rights reserved. Surfing suggestion: Wondering what you've been missing by not reading Homing In since 1988? Check the complete index of topics at this site.